Hundreds turn out for soapbox challenge Jump to media player The fundraiser featuring homemade carts competing at Englefield Park, Berkshire, was to raise money for a hospital charity. Revellers revved-up for soapbox derby Jump to media player Thousands of people attended the event in the bank holiday sunshine. The return of the wacky racers Jump to media player Soapbox derbies make a comeback across Wales this summer. 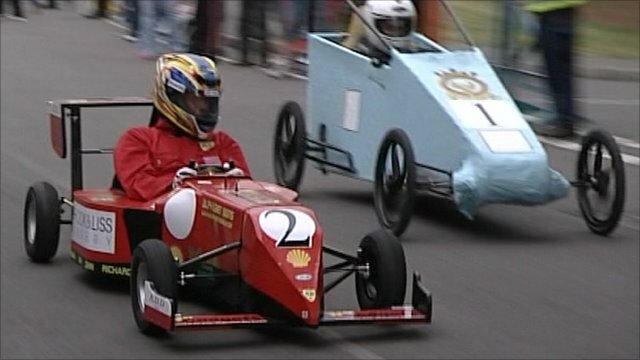 50mph in a cardboard box on wheels Jump to media player While motorsport is undeniably popular, the expense is just one reason most people will never even think of giving it a go - that's where the soapbox derby comes in. The Royal Berks Charity held its second annual Soapbox Challenge, raising money to support the Royal Berkshire Hospital in Reading. The carts, ranging from a First World War tank to a dustbin, had to navigate a downhill course scattered with straw bales and a jump.